A screencap from the new video by Disq, “Communication,” soon to be released by Saddle Creek Records. The new J Mascis album Elastic Days (2018, Sub Pop) has been on repeat all morning. I’ve always been a Dinosaur Jr. fan but never rabid. Mascis’ voice sounded overtly scruffy and rabid on a lot of those records (which, for me, showcased riffs rather than voice). Mascis’ vox are in control on this new, mostly acoustic collection of afternoon-lit folk rock songs that soar to next-level heights when he rips into one of his trademark cosmic guitar solos. Gorgeous stuff that sits right on top of the tunefulness scale with anything by Lou Barlow. I’d love to see him perform it live here in Omaha. Disq is a couple Wisconsin folks, Isaac deBroux-Slone and Raina Bock, who count Todd Rundgren, Weezer, Big Star and The Beatles among the musicians whose records helped inform their own creative process. 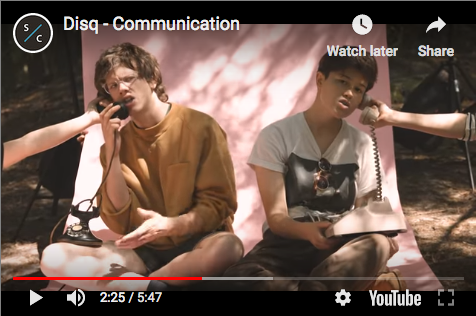 As part of its Document Series, Saddle Creek Records is releasing their single, “Communication” b/w “Parallel,” on Jan. 25, but you can check out one of the tracks below and pre-order the single now from the Saddle Creek Store. On this Throwback Thursday, here’s the list of the Top 20 and Next 15 bands from Lazy-i for the year 2008. This was created for The Reader’s annual Music Issue, which was published this week in November 2008.